Licensed under CloverDX Data Quality package. For detailed overview of rules, see List of Rules. The component is located in Palette → Data Quality. Validator validates data based on specified rules. To be able to use this component, you need a separate Data Quality license. Data records that passed the validation. Based on Input 0. Metadata of validated fields can contain more specific data type than input. For example, input metadata can contain a string field with date values and corresponding field on the first output port can have date as its field type. After validating that the string value is a date, Validator can convert the value to the date type. Metadata on the second output port can be enriched with fields containing details of validation failure. Available fields are listed in Error output mapping. An URL to external file describing validation rules. Use exclusively this field or previous one. Either Validation rules or Validation rules URL must be filled in. Validator allows you to specify a set of rules and check the validity of incoming data based on these rules. Validation rules can check various criteria like date format, numeric value, interval match, phone number validity and format, etc. The component sends validated data to the first output port. The first output port has the same metadata as the input port with the exception of validated fields that can have output metadata modified to a more specific data type. Data that failed to validate are sent to the second output port. When metadata on the second output port are the same as the metadata on the input port, invalid records are automatically sent to this output port. The second output port can be enriched with details of validation failure. 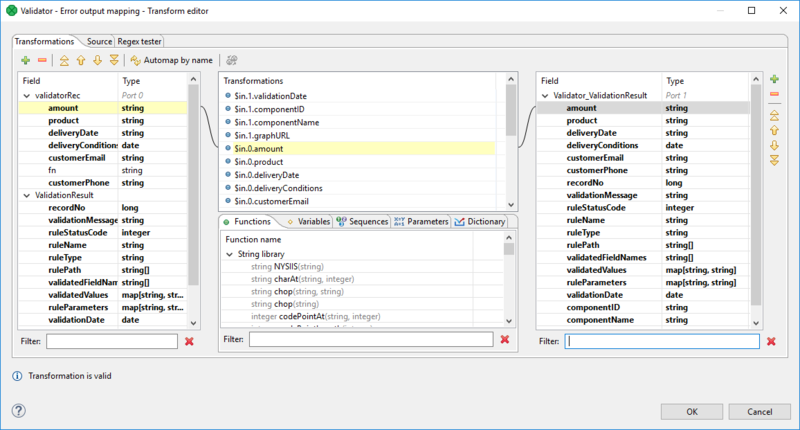 Validator rules editor provides all the power and features needed to set up validation rules. There are two tabs enabling to set up validation rules using different approaches: Use the Rules tab providing graphical interface to setup validation rules or switch to the Code tab with text editor and type rules by hand in form of xml. The Rules tab of the dialog is split up into three parts: Available rules, Active rules and	Rule parameters. Tab Code contains a text editor for editing validation rules in XML form, options to import and export of the validation rules, and an option to return to initial state of validation rules. Validation rules are the cornerstone of Validator. A validation rule is an evaluable condition that needs to be fulfilled to ensure that the field being validated contains a valid value. The evaluation of the condition if affected by corresponding environment settings. Check field value to contain decimal number. The condition is for the input field value to be a decimal number. The evaluation of condition is affected by locale setting specifying number format. For description of particular available validation rules, see Available rules. The Active rules pane contains a tree of active validation rules. The rules can be added to the tree from list of Available rules on the left side. A group named as All rules is a root of the tree of active validation rules. If any of active validation rules is chosen, the details of the rule settings are displayed in rule parameters below. In the case of more validation rules having the same output field, the value acquired from the last one is used. The new active validation rule can be added also by pressing the + button above validation tree. If you drag a field from metadata and drop it onto any of groups from active rules or between the rules of the group, the Select rule type dialog will appear. The dialog enables you to choose available rule to be added into group of rules. The added rule will be applied to preselected metadata field. Use filter to find the rule by name. Each validation rule is configurable by several parameters. The parameters are split up in to groups for better lucidity. There are Basic parameters, Locale and format settings and Common parameters. Most of basic parameters are rule specific parameters. See Available rules. Validation rules can be affected by locale and format settings. These settings are inherited from the parent group, by default. Trims ASCII control characters (0-31) and Unicode whitespace from beginning and end of the processed field. Note: this is different from CTL function trim (trim) that only removes ASCII control characters (0-31). Enables a strict date format validation. The strict validation parses the date, formats the date and compares the result with input value. Validation with strict validation is 25% slower than non-strict. Available since CloverDX 4.1. Common parameters are present for all rules. Rule can be disabled by unchecking of the button. The same functionality is provided by checkbox in column Enabled on a corresponding line in the list of active rules. User defined message. For example, it can contain the description of purpose of the rule. Checks validity of a product code against the list of products available since January 2001. Error output mapping provides a setup of mapping of fields to an optional second output port. If the second output port has the same metadata as the input port, no additional error output mapping is needed and the fields not passing the validation will be redirected to the second output port. In this case, the Validator works in the same way as Filter. See Filter. Validator provides much more functionality than Filter. Validator enables you to get detailed information, why validation of particular record fails and error output mapping provides graphical interface to map fields with validation failure details to corresponding metadata fields on the second output port. Validation failure details from following fields can be used. The fields can be seen as an additional secondary input port and error output mapping enables you to set up output mapping for the fields like in the reformat component. See Reformat. The number of a record in the incoming data. Records are being numbered from 1.
validationMessage string A message describing the reason of the validation failure. ruleStatusCode integer A unique error code identifier. ruleName string The name of the validation rule that failed. rulePath string A rule path in the validation rules tree. validatedFieldNames string The names of the fields being validated by the rule. validatedValues map[string,string] Values of fields being validated. validationDate date Date of processing of data using the Validator component. componentID string Identifier of the component in the graph. componentName string The name of the component. graphURL string A path to a graph. Validator error codes for particular available validation rules are listed in following table. 101 Empty/Nonempty field Input field is empty, expected to be nonempty. Input field is empty, expected to be nonempty. 102 Empty/Nonempty field Input field is nonempty, expected to be empty. Input field is nonempty, expected to be empty. 703 Enum Match Input value couldn't be converted to data type this rule works with Conversion of record field value failed. 704 Enum Match Input value did not match any of the enum values No match. 802 Interval Conversion of value from record failed. Conversion of value from record failed. 805 Interval Incoming value not in given interval. Incoming value not in given interval. 902 Comparison Conversion failed. Conversion failed. 904 Comparison Incoming value did not meet the condition. Incoming value did not meet the condition. 1003 Lookup Record match found in lookup. Record match found in lookup. 1004 Lookup No matching record in lookup. No matching record in lookup. 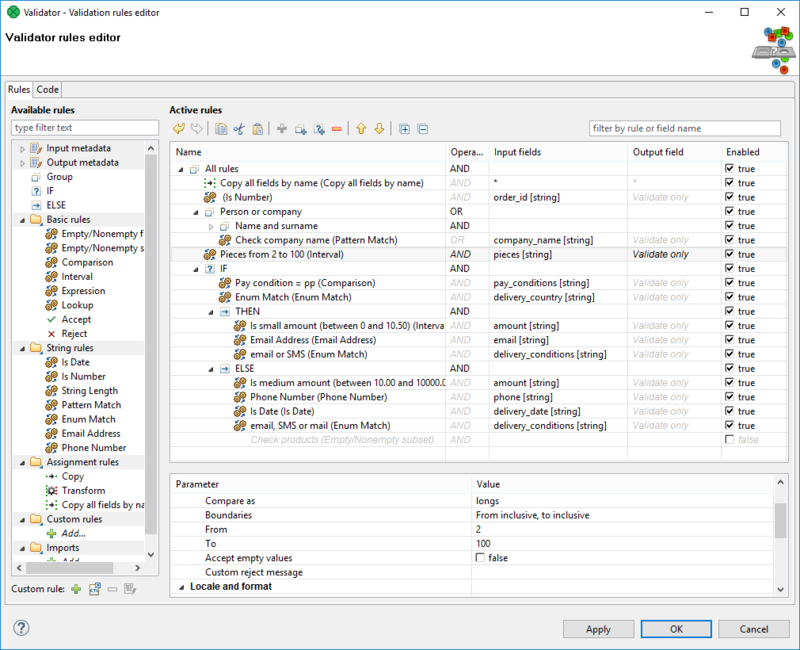 Available rules contain all available validation rules, Filter enabling fast access to particular items and list of Input and output metadata for easy use. The available validation rules are furthermore categorized to Groups, If - then - else, Basic rules, String rules, Assignment rules, Custom rules and Imports. The rule can be added into a list of active rules by double clicking on the rule in the list of available rules or by dragging and dropping from the list of available rules to desired place to tree of active rules. To find desired available validation rule or metadata field start typing its name into the filter input field. The rules and metadata fields are filtered on the fly. Input metadata contains a list of input metadata fields. Data type of the field is shown in square brackets after the field name. Fields from metadata can be assigned to any active rule by dragging and dropping from the list of metadata onto the active rule. The rules can be grouped together into rule groups. Each group of rules can have a user-defined name, the rule group including child rules can be enabled or disabled in the same way as a rule. The rule group can contain another rules or rule groups. Operator and Lazy evaluation settings can be set per rule group. Validation result of a rule group will be computed from validation results of rules in this group and the selected Operator of the given group. All rules from a group need to be valid in order for the group of rules to be considered as valid. At least one rule from a group needs to be valid in order for the group of rules to be considered as valid. Lazy evaluation setting affects whether all rules will be evaluated in a given group or if evaluation should skip rules that cannot affect the validation result of the whole group. Default value is enabled. Does not continue evaluating all rules in a given group once the result of the group is known. For example, as soon as a rule is evaluated as valid in an OR group, no more rules will be evaluated from this group because the result of the group is already known - group is valid. All rules in a given group will always be evaluated. By default, multiple error records can possibly be produced for a single input record. Every rule evaluated as false will send one validation error record to the error output port. Every rule evaluated as false in an OR group will produce one validation error record. Every rule evaluated as false in an AND group with lazy evaluation disabled will produce one validation error record. By changing the Produce error message settings from by rules to by group, each group will only produce one validation error record, even if more than one rule evaluated the validated record as invalid. Additionally, the Error message and Status code settings can be set to specify what values this record will contain. All groups is a root of tree of all validation rules. All above mentioned setting regarding groups are valid for root group in the same way. The If - then - else enables you to validate fields conditionally. The validation rule consists of condition and two subtrees of validation rules to check. If the condition is met, then the first subtree of validation rules is applied (the then branch). If the condition in not fulfilled, the second subtree of validation rules is applied (the else branch). The condition can be a single rule or group of rules. The condition needs to return boolean value. If the condition contains only assignment rule(s) not returning boolean value, the execution of graph fails. The condition itself works as a group - it can contain more rules as a child nodes. The conditionally processed validation subtrees work as groups too - zero, one or more validation rules or groups can be assigned to the then or else. The Else branch is optional, it can be empty or omitted. The user can delete the Else if the else branch is not needed. Input data contains fields type, weight and pieces. Type is type of cargo: bulk for bulk goods and piece for piece goods, weight is weight of cargo and pieces stands for number of pieces. If type is bulk, check that the field weight contains a numeric value and field pieces is empty. If type is not bulk check that the field pieces is a natural number and field weight is empty. 3.5.0-M2 Validator is available since 3.5.0-M2. 4.1.0 You can now use Strict validation parameter of Locale and format settings.